Stiffer penalties for using mobiles may encourage more people to use handsfree kits, but they can still be dangerous to use when driving, the Royal Society for the Prevention of Accidents (RoSPA) warned today. The new penalty, which came into effect at midnight on 27 February, means drivers caught using a mobile phone while driving can face a £60 fine, with three points added to their licence. If a case goes to court, a car driver can be fined up to £1,000, while bus and lorry drivers can be fined up to £2,500. The tough laws will undoubtedly encourage people to use hands-free kits instead, but the RoSPA believes people should not become complacent with them. "It is wrong for anyone to suggest that using a hands-free phone while driving is safe," says Kevin Clinton, head of road safety at RoSPA. Clinton goes on to say that while the RoSPA welcomes the stiffer penalties, drivers using a mobile phone in any manner is enough to distract them to the point where they become a danger. "Though there is no specific offence relating to hands-free phones, police can check telephone records in careless and dangerous driving cases and use them as evidence to show someone has been distracted. "It can lead to tougher sentencing because using a mobile phone while driving is likely to be viewed as an 'aggravating circumstance' by the courts," explains Clinton. Despite these warnings, mobile phone retailers appear keen to advise people to take the hands-free option. Carphone Warehouse 's 'Hang up or go hands-free' campaign aims to remind drivers of the new penalties. 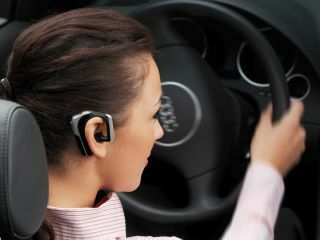 The company's website is running a number of offers on hands-free and in-car hands-free solutions. "We are making people aware of the changes, and reminding customers where we can," said a Carphone spokesperson. "We expect hands-free kit sales to increase as a result of the law change." However, the Carphone Warehouse website does warn: "If you are believed to be driving dangerously even when using a hands-free solution you can still be charged with driving without due care and attention". Vodaphone takes a more diplomatic view, as Libby Pritchard, the company's senior PR manager explains: "The views of RoSPA are consistent with Vodaphone's. We've always said people's primary concern while driving should be maintaining control of the vehicle." "While we absolutely endorse the government's move to make the penalties steeper, we appreciate people are in the habit of using their phone while driving, so we have a range of solutions to bring that within the law."